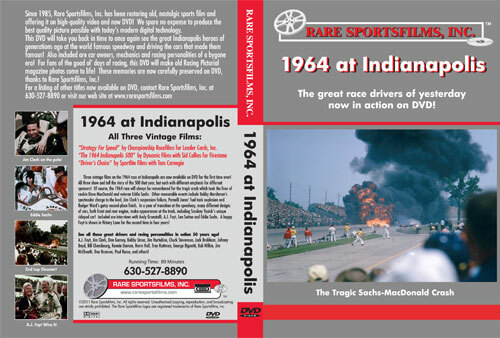 “Strategy For Speed”, “The 1964 Indianapolis 500” and “Driver’s Choice” are three vintage films about the 1964 Indianapolis 500, and all three are included here in COLOR on this new 89-minute DVD from Rare Sportsfilms, Inc! Each of these films is entirely different, even as they all show the events recorded during the month of May 1964 at the speedway and during the 500-mile race! Of course, the 1964 500 will always be remembered for the most tragic wreck in speedway history, which took the lives of rookie Dave MacDonald and popular veteran Eddie Sachs. The first film, Strategy For Speed by Championship Racefilms, revolves around the Leader Card team of Rodger Ward (#2 Kaiser Aluminum Special), Don Branson (#5 Wynn’s Friction-Proofing Spl) and Chuck Stevenson (#95 Diet Rite Cola Spl), and accordingly shows the race through the eyes of the three-car team. You’ll take a trip around the track at speed with Rodger Ward and get a feel for “what it’s like out there”! During practice you’ll see incidents involving Jim Hurtubise, Branson, Ebb Rose, Bobby Unser and Bobby Johns. Ward, Branson, Stevenson, Bill Cheesbourg and Bob Wente are all shown qualifying, then the race is shown (see below), with Ward finishing second, Branson 12th and Stevenson being eliminated in the spectacular second-lap crash. The gay and colorful festivities of raceday are a sharp contrast to what will soon follow, as Jim Clark jumps into the lead at the start, with Bobby Marshman second followed by Ward, Foyt and Dan Gurney the first five after one lap. Near the end of lap two Dave MacDonald spins into the inside wall coming off turn four. His car immediately explodes in a ball of flame and skids across the track, directly into the path of oncoming Eddie Sachs. As Sachs plows into MacDonald his car also explodes. Johnny Rutherford's car climbs over Bobby Unser's Novi. Ronnie Duman smashes into the inside wall and his car bursts into flame, with Chuck Stevenson and Norm Hall also involved, as huge billows of black smoke pour skyward. The accident is then described in detail and re-shown in slo-motion. A burned and bandaged Ronnie Duman is helped into a waiting helicopter for the trip to Methodist hospital. Altogether, seven cars are out of the race, and for the first time in speedway history the race is stopped for an accident. After an hour and 43-minute delay for cleanup, Clark and Marshman again take up the battle for the lead, with Foyt and Jones fighting for fifth. Hard-charging Marshman passes Clark to take the lead on lap seven, and stretches his lead to 27 seconds! However, on one of his low passes on the apron, Bobby's car bottoms out, tearing out the plug in his oil pan. Clark inherits the lead, but on lap 47, his rear suspension is torn apart when a LR tire chunks. Rodger Ward comes in early for his first pit stop, but a fuel mixture valve jams, forcing him into making twice as many pit stops as planned. Meanwhile, Foyt and Jones now battle for the lead. After 140 miles, Jones makes a scheduled pit stop, but as he pulls away, his gas tank explodes! Parnelli leaps out of the car near the end of the pits, his #98 enveloped in an invisible alcohol flame! With Jones out, Foyt has the lead all to himself. He pulls up on Ward and passes him, putting Rodger a full lap behind. As the race grinds on, others are shown having their troubles: Troy Ruttman spins out in turn four. Bill Cheesbourg blows his engine on lap 131. Bobby Grim spins out in turn two with only four laps to go. But this race belongs to A.J. Foyt, now a two-time winner of the Indianapolis 500! You can get your own DVD containing all three of these historic films for only $29.95 + $4.00 for shipping and handling!